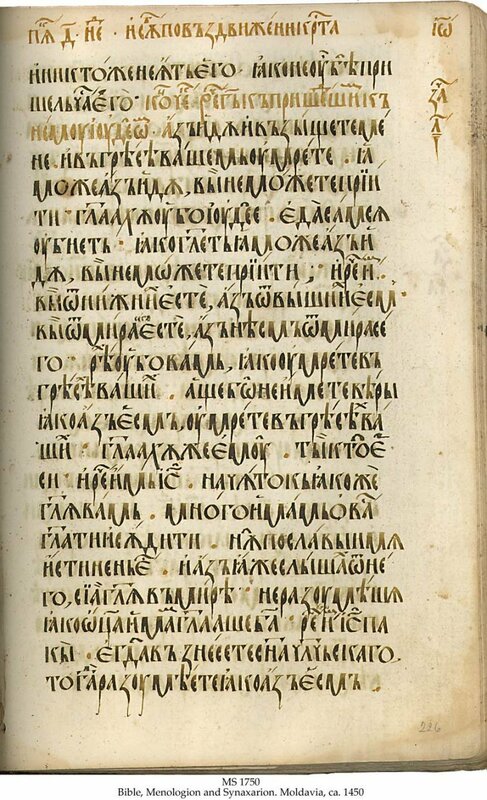 Description	 MS in Church Slavonic on paper, Monastery of Neamtu, Moldavia, ca. 1450, 266 ff. 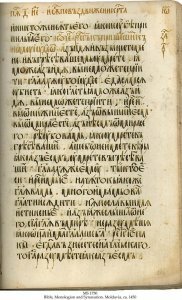 (-6), 32x22 cm, 2 columns, (26x15 cm), 22-26 lines in a elegant Cyrillic half-uncial, by Gabriel Uric of Neamtu, 2-line initials in calligraphic ujaz, strips of interlacing ornament in gold and colours at the incipits of the prologues, rubrics, page-heading, sigla, marginal chapter numbers with gold, some also with red. Binding	 Moldavia, 17th c., brown leather over bevelled wooden boards, sewn on 4 cords, gold- and silver-tooled, decorative borders, front cover with central medallion of the Passion with Mary and John in gold, the 4 evangelists surrounding in silver, back cover with a saint threatened by a Turk, in silver, all against a background of Byzantine-Russian architecture. Provenance	 1. Gabriel Uric of the Monastery of Neamtu, Moldavia (from ca. 1450); 2. Monastery of Neamtu, Moldavia (after 1450); 3. Hartung & Karl, München, Auktion, 2.11.1993:2; 4. Sam Fogg, London. Commentary	 Colophon by the scribe Gabriel Uric of the Monastery of Neamtu, who is known from the colophons of MSS between 1424 and 1447. He was the initiator of a school of calligraphy, manuscript illumination, orthography and literature which copied Middle Bulgarian versions of Church Slavonic literature. These manuscripts maintained the continuity of Bulgarian literature after the Turkish suppression of the Bulgarian and Serbian states.